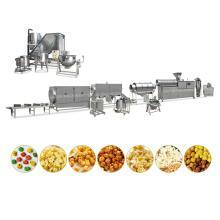 This popcorn chips snack machinery is equipped with compelling ventilation heating system, inner layer air flow baffle, accurate temperature control, and thickened insulation layer. Its advanced technique provides all the necessary functions in low power, high heating efficiency, low running cost, and less machine maintenance. With coating machine ,different flavors are available , meanwhile , using this hot air popper to puff snack pellets instead of frying machine is a new progress ,which is much more healthier and economical .